Small spaces are always a challenge, but the living room is one that needs special care, since it is where most people spend their time. It is important that the living room looks spacious and has sufficient seating. 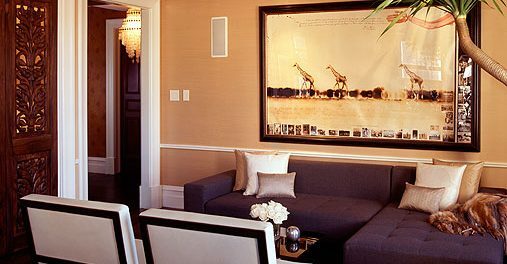 Use mirrors and wallpaper – Small living rooms can feel cramped and boxed in. To improve lighting and give the room depth, add a few hanging mirrors. Wall paper can also create depth in a space and add to making a small space more inviting. Add hidden storage – Choose furniture with built in storage. A good choice is a coffee table with hidden drawers at the base. If more storage is needed, look at purchasing a sofa with storage at the bottom. More storage options will keep your space neat and give the illusion of space. Choose small-scale furniture – Instead of choosing bulky furniture, choose small scale designs. Most antique and modern furniture stores stock many designs that will easily fit into small spaces. Look up – If your space has a high ceiling, make the most of it by added soft light fixtures that light up the ceiling. This will make your space seem far larger. Completely fill a corner – If you have a piece of bulky furniture, choose to place it in the corner of the room. For example a large sectional, will provide with ample seating and make the most of an otherwise unused corner.